Did you know we adopt out birds? We have had several different species over the past year. Our wildlife committee is also wanting to educate you on bats and why they wake up from hibernation. Read about a special volunteer donor matched program that was hugely successful. Lastly upcoming events you can take part in 2019! Click here to find out what's happening in 2019! It’s been a hot summer! Cool down with the new and improved GHS newsletter - now called The Paw Press! 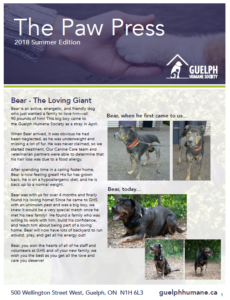 We are excited to share stories of Bear, our big softy, new staff members, partners in our community and a special volunteer story as well. An exciting announcement is also inside! Our Events team is preparing for our 125th celebration fundraising gala on Saturday, November 3, 2018! (Check out the Upcoming Events section!). Click here to read The Paw Press Summer 2018 Edition! Wildlife Season is coming up! The Guelph Humane Society will be presenting at the Canadian Federation of HumaneSocieties (CFHS) National Animal Welfare Conference in April 2018! 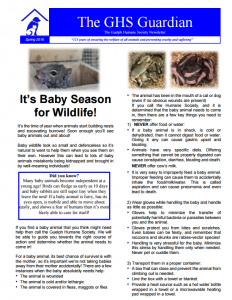 Read about their presentation and what you can do for your local wildlife. Do you know about cat licensing? Beginning in January, mandatory cat licencing took effect. Read about the benefits of licencing your cat today! Join us in celebrating the Guelph Humane Societies 125th year in operation! See how we've changed over the years to better serve our ever growing community. 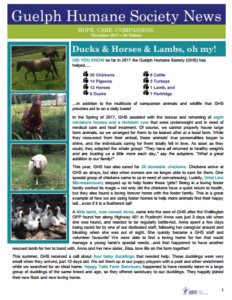 Ducks, Horses & Lambs, oh my! This year the Guelph Humane Society helped many farm animals in need. Check out this newsletter to read about some of these happy tails we were able to provide to our farm animals! Its the holiday dream! Learn how to give a pet as a gift, the right way! Did you hear about our Microchip Clinic? This fall, the Guelph Humane Society hosted its very first Microchip Clinic! Read more about it in this newsletter! HELP US BUILD OUR NEW HOME! We are moving, and will have a new location to call home! 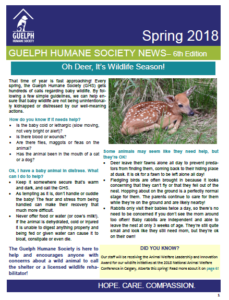 Learn more about this new opportunity the Guelph Humane Society has in this newsletter. 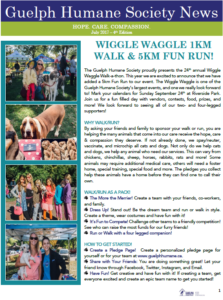 5km Run has been added to our Wiggle Waggle Walk! The GHS is proudly presenting the 24th annual Wiggle Waggle Walk-a-thon. This year we are excited to add a 5km Fun Run or timed Run for those who are training! Read more about this event in our NEWSLETTER! What is the Special Souls Adoption Program?! Get the full scoop in our NEWSLETTER! We are excited to announce that we have expanded our Satellite Adoptions Locations to Fergus! Read the full article in our NEWSLETTER! Every summer, too many pets are left in life-threatening situations inside hot vehicles. Learn more facts in our NEWSLETTER! AND TAKE THE PLEDGE HERE FOR NO HOT PETS! 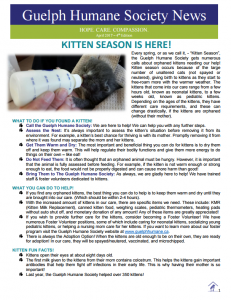 What do you do when you find an orphaned kitten? How can you do to help GHS? Read the full article in our NEWSLETTER! The GHS has New Hours! As of April 1st, the GHS has new expanded hours! Full scoop in our NEWSLETTER! Do You Know Your Cat?! The GHS receives over 250 lost reports for cats alone. Cats comes in different colors and patterns. Do you know the technical term to describe your cats' appearance? Read the full article in our NEWSLETTER! Did You Know That We Have A Wildlife Committee?! Our Wildlife Committee is composed of staff members, who are dedicated to the care and protection of the wildlife in our community. Learn more in our NEWSLETTER! Mark your calendars - Saturday, June 17th for the GHS Annual Garage Sale! Find more details in our NEWSLETTER! Myth: Pets shouldn't be adopted out during the holidays, because they get returned. Recent studies shows that pets as gifts have a lower return rate! Read the full article in our NEWSLETTER! 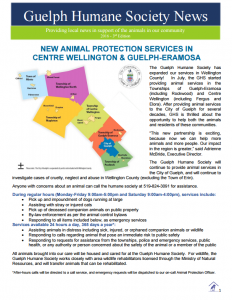 Did you know that the Guelph Humane Society has expanded their area of services? 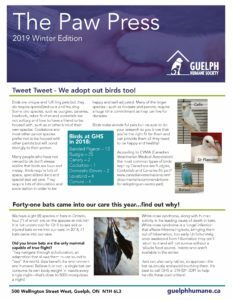 In July, the GHS started providing animal services in the Townships of Guelph-Eramosa (including Rockwood) and Centre Wellington (including Fergus and Elora). Read the full article in our NEWSLETTER! After four years, Josh and Carrots have been reunited! Thanks to Carrots’ microchip, our staff were able to contact Josh and let him know that Carrots had been found over 125 kilometers away! Carrots recognized Josh right away, and our staff were in tears seeing their heartfelt reunion. Carrots and Josh are on their way back to Niagara Falls…if only Carrots could tell us about his adventure that lead him to Guelph! We are so lucky to get to witness a happy ending like this! Read more Happy Tails in our NEWSLETTER! EXTRA EXTRA, read all about it! 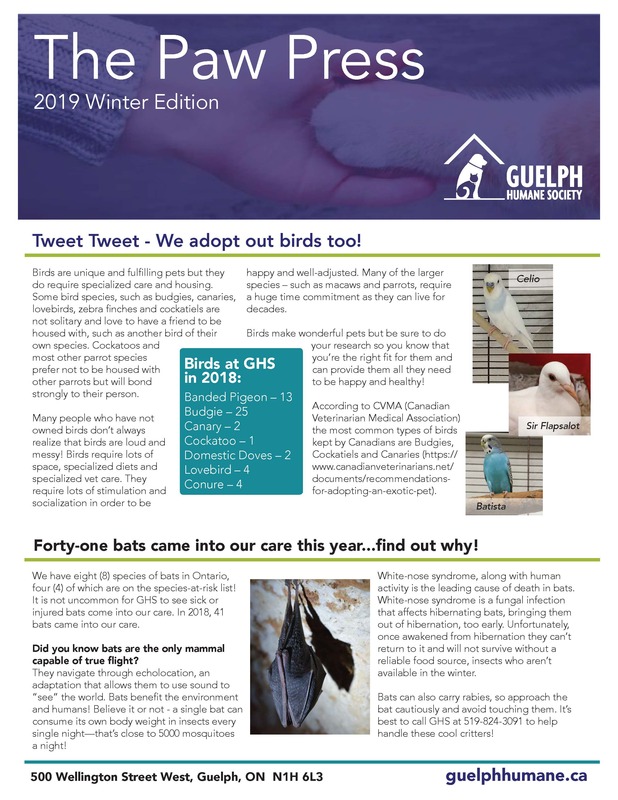 We are happy to announce that our Spring Newsletter is fresh off the press! Spring is the most popular time for Wildlife, and we have many exciting articles and interesting facts on our Wildlife friends! Test your Wildlife knowledge by answering these most common questions. Can you match the baby Wildlife with the Adult? Did you know that one goldfish requires 10 gallons of water? That means if you want 5 Goldfish, you need a 50 gallon tank! A goldfish can live up to 30 years if taken care of properly! Kittens are cute and cuddly but have a lot of energy! They will be very curious of their surroundings and will want to make everything into a play toy. Also, cats have the natural instinct to scratch items, so be prepared for scratches on the furniture! Here are some things you should consider before choosing a new family pet.